I have looked at the mooring regulations without success. My understanding is I can leave the mooring for us to 42 days without explanation. Longer than that requires approval. Does anyone know the regulations on this matter? I think that you need to give RMS notice if you are leaving your mooring for more than 28 days in NSW. I have just been through a "please explain your vessels non-attendance" process with my mooring after going cruising north last year. I am berthed in Lavender bay. They watch these like they are their own children. I will try a call this morning and post the results. Your vessel must not be absent from its mooring for more than 28 consecutive days, unless Roads and Maritime has been notified in writing and written approval has been provided. While your vessel is absent from the mooring, no other vessel is authorised to occupy the site. I wrote to them in 2017 when mine was going to be vacant for longer than this, the approval seemed to be a formality although there was no wait list in my bay then. Just a little warning, I left my mooring unattended for 3 month plus in port hacking burraneer bay , RMS was not an issue but the growth on the first two/three meters of my mooring line was tremendous. I was alone on the boat when I came back and had a tough time getting rid of the spongious sticky stufs that were wrapped around the loop, while holding the rope... it would not go around the cleat. With a bit of a southerly breeze I felt really lonely with my mooring line in hand and not being able to attach it on the boat... Just keep that in mind. After that I was wandering if there was any secret technique to avoid growth on rope. Is it stupid to use anti fooling paint? Want me to mind it for you? ?? Any issues with this sort of thing in qld? leaving mooring for long periods? 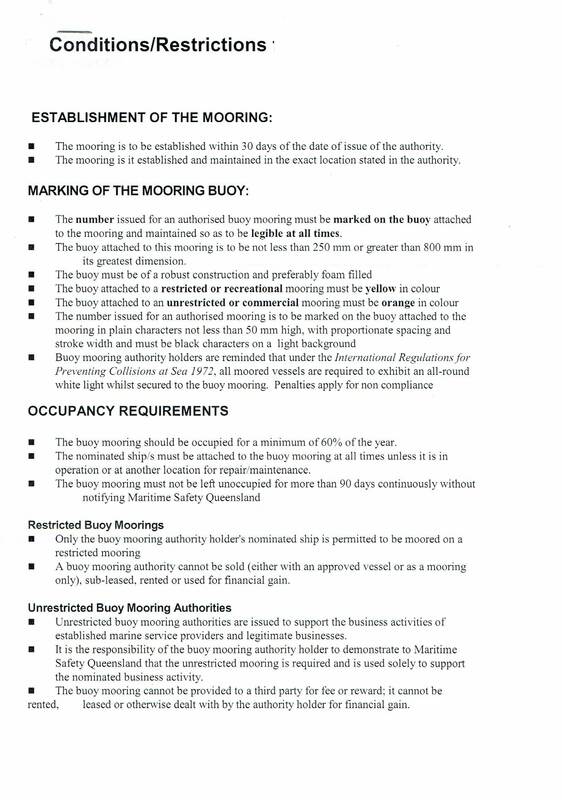 Qld mooring conditions below, 90 days without notification. As with NSW some areas are more highly policed than others I think. No secret technique that I know of. I was away for 5 months, so my mooring had a lot of growth on it. When I picked it up, I put a length of rope through it and tied it off to the boat. After it dried a bit, scrubbed it with a stiff brush. Took a few weeks of intermittent scrubbing, but now back to normal. I've been away from my mooring in NSW on several occasions and while I have notified the local office I would be away for an extended unknown period cruising to where-ever, I have never had a reply or approval to do so! And this is exactly the way it should be, I believe.